Photomontage by Michael Perkins. Original Kennedy family image by Richard Avedon, now copyright The Smithsonian Institution. All rights reserved. ABRAHAM ZAPRUDER almost didn’t change history. The Dallas women’s wear designer, a refugee from Soviet Russia and a Democrat, was eager to take a break from his office on November 22, 1963 to head down to the city’s Dealey Plaza, accompanied by his receptionist, to get a look at the man for whom he had voted three years earlier. An assistant suggested he first swing by his house and pick up his movie camera, a Bell & Howell Zoomatic “Director” Model 414 PD. Standing on a concrete pedestal, framing the presidential motorcade as it made its turn onto Elm Street, Zapruder, too stunned by what he was seeing through his viewfinder to even stop, captured 26.6 seconds that would document the world’s shift from innocence to agony. 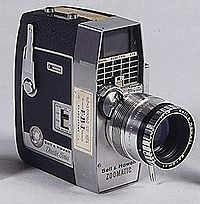 Abraham Zapruder’s Bell & Howell Movie Camera. He had no sophisticated experience documenting news stories. He had never taken a course on photography. Understandably, for the rest of his life, he could never again even bring himself to shoot either still or movie images. But that day, he had a camera. And if anything of Abraham Zapruder’s unique role in the Kennedy tragedy is emblematic of the fatefulness of photography, of being present when things are ready to happen, it is those 486 frames of Kodachrome, footage that no one….no news service, no network, no freelancer…nobody but a dressmaker with an amateur camera was poised to capture. Because of Abraham Zapruder, the chaos and fear of those seconds now represent a time line, a sequence. The event has parameters, colors. Tone. Zapruder’s camera transformed him from “a” witness to “the” witness, the image maker of record, just as it had for others when the Hindenburg erupted into flame, the Arizona billowed black smoke, and, a generation later, Challenger painted the sky with a billion fiery atoms. 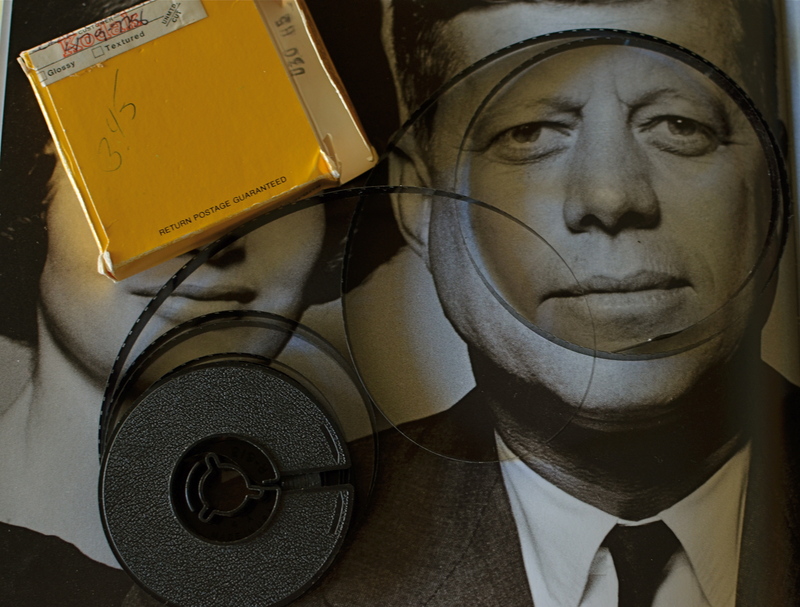 Half a century later, the multiplier effect of personal media devices guarantees that each key event in our history is documented by hundreds, even thousands of witnesses at once, but, on that horrible day in Dallas, Abraham Zapruder’s preservation of murder on celluloid was an outlier, an accident. And by the end of Friday, November, 22, 1963, the day the world unspooled, he was no longer merely a tourist taking a home movie. He was the sole possessor of Exhibit A. This entry was posted on November 6, 2013 by Michael Perkins. It was filed under History, Journalism, Photojournalism and was tagged with Abraham Zapruder, Dealey Plaza, JFK Assassination, Zapruder film.